A view of Fiesole, the town my mother was born in and lived for the first few years of her life. “I told Papi that’s where I wanted to bury him. I thought it was the most beautiful sight I had ever seen.” My mom stated with both a hint of sadness and a touch of excitement leftover from her childhood. “You surely did, you were such a funny young thing. It really is magnificent though.” My Ima (grandmother) responded as she stifled the tears that quickly came down. My mom was pointing to a cemetery nestled on the hilltop of Fiesole, a town just outside of Florence. She was born in this town and grew up here for the first few years of her life while her father studied art. Now, 46 years after my grandparents last lived here and four years after my Aba’s (my grandfather) passing, we returned to the town that gave us all life. As the sun set and illuminated the landscape in a magnificent reddish orange hue, we all stirred in our own memories and nostalgia. My mom, myself, and my Ima (grandmother) visiting Fiesole where my grandparents lived 46 years ago. Ever since I was a child I was encapsulated by the stories my family would tell of their time living in Italy. The tales of my Aba visiting the “Café Blu” right after class to order his regular “doppio corretto” (double espresso with brandy) or of my five-year-old mom kindly shooing away her neighbor Pepino who had a crush on her sister, or my Ima strolling around Florence and knowing every corner like the back of her hand. I was even more hypnotized by the gorgeous paintings of the Italian countryside my Aba painted full of cypress trees, rustic houses and blue skies. I knew that Italy was somewhere I had to discover for myself one day to explore its beauty and understand why this country was so significant for my family. When I was 12 I got my first chance on a family trip to Europe. We visited the classic tourist cities, Rome, Venice and Florence and I was hooked. Four years later, I was determined to go back as an exchange student. After working my tail off, raising money and enlisting support from my family, I enrolled in a study abroad program and shipped off to Milan to live with a host family. I spent seven months there completely immersed in the culture, language and lifestyle. I left feeling like my time there wasn’t over. I had a great grasp on the language, but I was just getting started. Flash forward seven years, and I got the opportunity of a lifetime to move to Bologna while my Fiance completed his first year of graduate school in International Relations. We took a leap of faith and moved there together for 10 months. From the first time I stepped foot in Italy to now, I have visited 25 cities and lived there for almost a year and a half total. Italy is still the most beautiful country I have ever visited but my experience there has not always been pretty. From living as an insider to living as an outsider I’ve had extreme highs, dramatic lows and everything in between. Here are some of my musings + lessons that include a little bit of each! 1) Living with a host family and living on your own in Italy are completely different experiences. 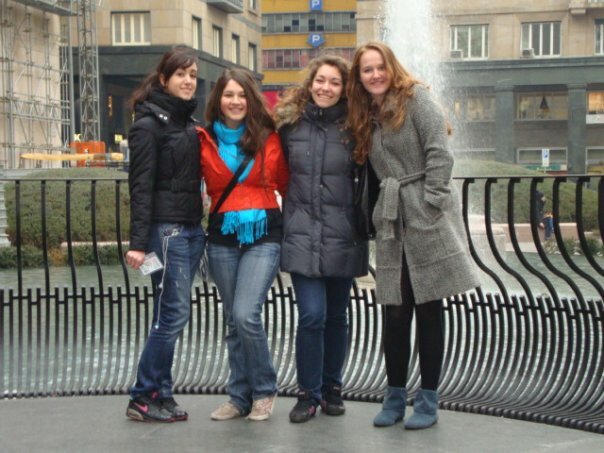 My first go-round living in Italy, I had the most inclusive, kind and helpful host family imaginable. The first week I landed, I was invited out every single night with my host siblings’ friends and family members. Even though I didn’t speak a lick of Italian, they still made an effort to include me in conversations and made me feel welcome. I experienced how important family is in Italian culture through weekend excursions, daily homemade lunches with my Italian Nonna and constant hugs and kisses. I was also easily integrated with people my own age and made friends quickly because I was attending a local high school. This experience made me appreciate Italian culture on a whole new level and made me fall in love with Italy and her people. The second time I lived in Italy, I didn’t have the comfort of a host family to accommodate me and make me feel welcomed. When Christian and I moved to Bologna, we didn’t even have an apartment to live in and had to figure everything out on our own. Luckily, I speak Italian and was able to find us a place to live despite the bureaucratic barriers that made it extremely difficult. We faced hilarious yet infuriating snafus trying to get internet and pay our bills that resulted in multiple arguments with our landlord and customer service attendants that didn’t know how to do their job. Even though I am not a very confrontational person in English, I learned that Italian makes me feisty. Not in a mean way, but more of a “necessary if you want to get anything done” kinda way. Our experience of living on our own made us outsiders and made it challenging to immerse ourselves and make local connections in a meaningful way. My AMAZING Italian host family including my two Nonna's (my host brother wasn't here). Christian and I got to visit them while living in Italy. I learned that the best way to experience Italy in an intimate way is to have an “in” with a family or friends since this is where Italians place the highest priority. If you’re living outside of that loop, the experience can still be rewarding. However, it is frustrating when setting up the necessities of life, and you don’t get to experience the warmth that is so prominent and special in Italian households. 2) The culture of going out for going out’s sake spans across all ages and it’s something we desperately need in the U.S. I remember the first time Christian and I visited Piazza Maggiore at night time. Lights illuminated every corner and laughter filled the air. There were parents strolling with kids, college students sitting on the Cathedral stairs and elderly men and women drinking and talking late into the evening. People of all ages were out until midnight and beyond enjoying each other’s’ company, getting fresh air and delighting in life. I had never seen anything like it. The college students made sense, but the toddlers and 80 year olds? I was floored. Not only that, but many of these people weren’t necessarily out “doing” anything. They were going out just to go out. They didn’t have a destination and they didn’t need to drop a ton of money. They were just soaking up life. I quickly adopted this mentality and found myself strolling the piazza and grabbing a gelato with Christian even when there was nothing to “do.” It definitely beat staying home and watching Netflix, and it didn’t require any effort. This culture of going out for going out’s sake no matter what the age, is something we desperately need in the US, where our mentality of going out is quite toxic. More and more, I have witnessed my friends and even myself many times dread going out because it’s such a commitment. Yet at the same time there’s an undeniable pressure to “make the most of our youth.” It’s much worse for older people, who are often put into nursing homes and who’s social needs are undermined. This has led to more and more people feeling lonely and isolated in their own homes. The accessibility of going out in Italy promotes healthy social lives for everyone and is something I already deeply miss. 3) Beauty is everywhere and it will make you feel underdressed and inspired all at once. It’s no secret that Italians appreciate beauty. Historically, Italy has produced some of the most distinguished artists in the world, the most magnificent architecture, and the most innovative fashion designers. Walking through any city in Italy is like walking through a living museum. There is history and beauty at every corner. What impressed me even further is how seriously Italians take their appreciation for beauty and creating beautiful things. Every window is pristinely decorated down to the last square centimeter. People dress to be seen even if they are only going to the dentist. Through fashion, people take pride in how they present themselves and make an effort to express their individuality - men and women alike. As a result, I noticed they walked with confidence, leisure and elegance all at once. I was stopped dead in my tracks countless times to gaze at a beautiful storefront window, or to observe how elegantly an Italian couple carried themselves. When I was visiting Milan with my brother and sister, my brother laughed and said that everyone made him feel like a hobo. This my friends, is a common feeling. In fact, the first time I was in Italy my fashion game was weak AF and I dressed like a ragamuffin. I remember walking around the streets of Milan with bright blue moon boots, a bright orange members only jacket and ripped up jeans (but not the fashionable distressed kind, the real kind). Everyone else was sleek as hell in their black leather jackets and leather boots, and I remember making a mental note to myself to change my wardrobe. People are so superbly dressed and beautiful in Italy, that I don't think I've even seen an awkward teenager. Like the awkward phase is nonexistent, and if you are not prepared, you will want to run and hide until you are ready to look flawless. I'm not lying when I told you Italians took fashion seriously. Even the dogs dress better than many people do in the U.S. It might be easy for some people to see the cultural importance of beauty as vanity, but I interpreted it as creativity, thoughtfulness and care. This deep appreciation for beauty has inspired me to take better care of my own space that surrounds me and has given me #fashioninspo for a lifetime. 4) In Bologna, the customer is never right. I have never been anywhere in my life with such horrible customer service. I know that’s harsh, but it’s true. After working in retail and restaurants since I was 14, I learned to treat the customer with kindness, care and respect and I expect this when I go places. (Obviously as a customer, I also treat the store attendants, waiters, and staff with the same respect). In many places I went in Bologna, I was straight shook at how disrespectfully I was treated for literally just walking into the building. If I asked customer service attendants for assistance they would often reply with “there is absolutely nothing I can do for you.” If I insisted, they would somehow blame me for not knowing the answer to my own question, and then proceed to argue with the other employees. After experiencing this insane phenomenon time after time, Christian and I came up with a few theories as to why this is. 1) I think it’s because Italian’s value time with family and friends so much, that they save all of their positive energy and attitude for the people close to them rather than spend it on the strangers that come in to their stores. 2) Christian being the economist that he is, thinks it has to do with the fact that the job market in Italy is really bad right now. When people do get hired, even if it’s just at a store, it’s impossible to fire them because of a law that only allows people to be fired under extreme circumstances. Since people don't have act well to keep their job, they don't. Truthfully, it’s probably a combination of both plus other factors that we will never understand. P.S. Keep in mind that this observation was primarily in Bologna, and I found that when I traveled to many other cities in Italy, the customer service was often welcoming and delightful. 5) The quality of food really is out of this world. A classic "Prosciuterria" that sells cured meats, cheeses and deli goods. Like fashion and art, Italians take pride in their food. What amazed me most however was not how delicious the meals were at restaurants, but actually the quality of food in general. I cook most of my meals and I was pleasantly surprised to find how fresh all of the ingredients were that I could buy at the grocery stores, farmers markets, and corner shops. The produce was vibrant in color and always included a label with where it came from. Almost everything came from somewhere in Italy, and if not, it came from Spain or Morocco. The cured meats were also to die for. They were minimally processed and you could tell that they actually came from an animal instead of a machine. Not only that, but all these items were extremely accessible. I could walk across the street from my apartment in any direction and pick up groceries for the week. This access and abundance of high quality food made it easy to eat healthily and joyfully. 6) It’s worth learning the language if you are staying there longer than a few weeks. I really don’t think we would have been able to survive if I didn’t speak Italian. In fact, when Christian and I were looking for apartments, the majority of the locations made a special note saying that only people who spoke Italian were allowed to rent from them. Even though most of the younger generation in Italy speaks English, the older generation usually doesn’t. I noticed that many of my English-speaking friends struggled with this and felt like they were constantly being treated poorly for not speaking Italian. This negatively impacted their experience and I know it robbed them of fully enjoying their time in Italy. I noticed that many Italians treated me a lot nicer, and when I did get into customer service scuffles I was able to sort them out because I could verbally assert myself. Not only that, but Italian’s love when you learn their language. It’s not a common language, so when you learn it, you are showing that you took the effort to learn something valuable about Italian culture. Even if you just learn how to order food, or have a short taxi ride conversation, it’s worth it. Plus, Italian is a super fun language to speak. It is musical, romantic and beautiful. I also believe learning a new language can open up new sides of yourself and help you unlock new ways of thinking that are embedded in the culture that speaks it. Learning Italian has helped me develop a deep love for food, and to find beauty in the smallest details. It has also unlocked a side of myself that is more assertive and emotionally expressive. 7) The best cities to visit are the ones you don’t know about. One of my Aba's Paintings of the Umbrian landscape called "Casa Colonica" 2003. I have never been to a city in Italy that wasn’t magnificent. However, the common route of visiting Florence, Rome and Venice is just the tip of the iceberg. Italy is composed of 20 unique regions that each contain their own history, character and cuisine. The more places you visit, the better picture you get of how truly remarkable Italy is as a country. Luckily, this is quite easy because Italy has an amazing train system, and many of the cities are a short distance apart. If you are there, be sure to take advantage of this, and go off the beaten path. Choose any random city and you are sure to be blown away. My all-time favorite places I have visited in Italy are Assisi, Cagliari, Trieste and Ravenna. Assisi is the birthplace of St. Francis of Assisi and is located in the Umbria region. It is an ancient cobblestone city full of antique churches, rustic buildings, and gorgeous views of the Italian countryside. It was in Assisi that I first looked out a window and saw the images of my Aba’s paintings in real life. It was an experience that brought me to tears, and one I will hold in my heart forever. Christian and I in Cagliari. It's also where we got engaged, so of course I love it! Cagliari, is located in the south of Sardinia and has to be reached by plane. Sardinia has a distinct history from the rest of Italy since it is an island. In ancient times, it was often ravaged by pirates, and has noticeable influences from Northern Africa, France, and mainland Italy. Cagliari has amazing seafood, vibrant nightlife, and an amazing wetland for flamingos. Just a short car ride away you can also find the most exquisite beaches full of turquoise water and white sand. Chia beach, about an hour away from Cagliari. Trieste is located in the northeastern part of Italy and used to be part of the Austro-Hungarian empire. What I loved most about Trieste was its vibe. The people were super chill, there were a lot of craft breweries, and it was the most relaxed place I have ever been in Italy. The architecture was characterized by the Austro-Hungarian style, and the food had influences of eastern Europe. It was delightful. My siblings and I exploring a castle in Trieste, and taking in the beautiful views. Ravenna, is a small city about an hour east of Bologna. What makes Ravenna so unique are its stunning mosaics. On the outside the buildings and churches look quite mundane, but once you walk inside it’s impossible to not be blown away by the detail, color, and intricacy of the artwork. Plotting my next mission to Italy...creating a Nia + Wellness Retreat! Italy is a land full of wonder, beauty, and romance. It is a land that I grew up yearning for, a land that I discovered my independence, a land that gave life to my family, and a land I will always return to. With these experiences, I will be able to contribute my own memories to my family’s story. Perhaps I will even be able to share some of the magic of Italy with you one day…maybe in a Nia + Wellness retreat?